Why Has Artbox M'sia 2018 Received So Many Negative Reviews? Artbox was an event that seemed set up for success. Originating from Thailand, the self-styled “first and largest retrofitted creative market” first opened its doors in Makkasan, Bangkok in June 2015. In Singapore where it has run for 2 years straight, the 2018 edition alone saw a total of 757,000 visitors over six days. 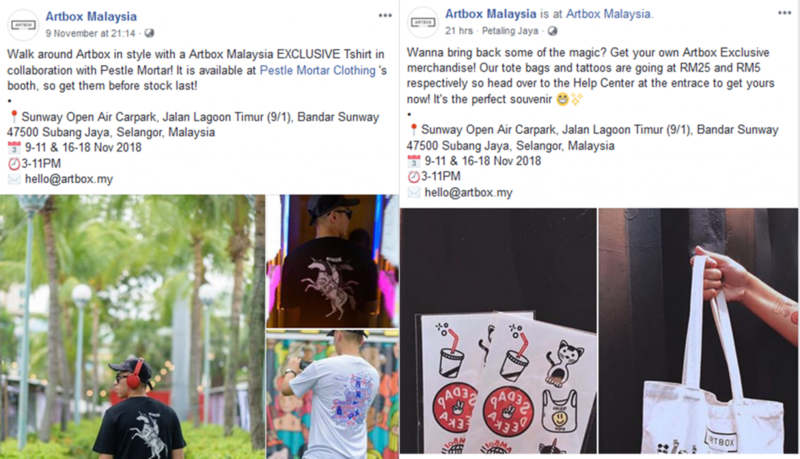 So when Artbox made its way to Malaysia, the excitement that people felt was expected. When the gates opened to the public last Friday, thousands streamed in, eager to indulge “in some hearty comfort food”, shop and probably get a good shot for the ‘gram. What came next was a slew of complaints on social media. Due to Facebook recently revamping its rating and reviews system to only show “Recommendations” instead, we are unable to get the full numbers of “does not recommend” comments made, versus the “recommends” (165 people, at the time of writing) on the Artbox Malaysia Facebook page. 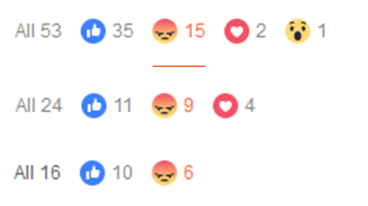 A quick glance over the reactions to recent posts on Artbox Malaysia further confirmed a certain degree of public unhappiness (as expressed by the “angry” emoji). 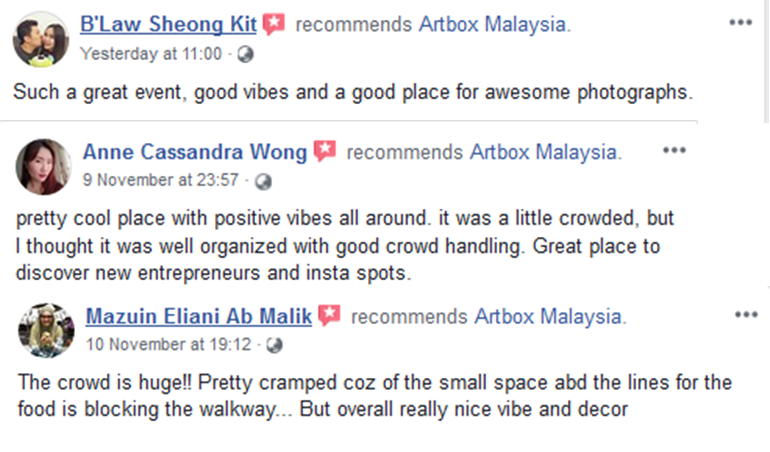 Negative reactions on recent FB posts from the Artbox Malaysia page. Overcrowdedness aside (a common complaint at Artbox events), there has to be more behind this negativity than meets the eye. After searching through the comments, speaking with some of the event goers, and attending the event ourselves, we think we have a fairly good idea on why some people are so unhappy with what should have been a fun and very Insta-worthy occasion. At first, we were puzzled by a line in this viral post (1.4k comments and 2.2k shares) that said “95% foods and stuffs [sic] from Malaysia”. 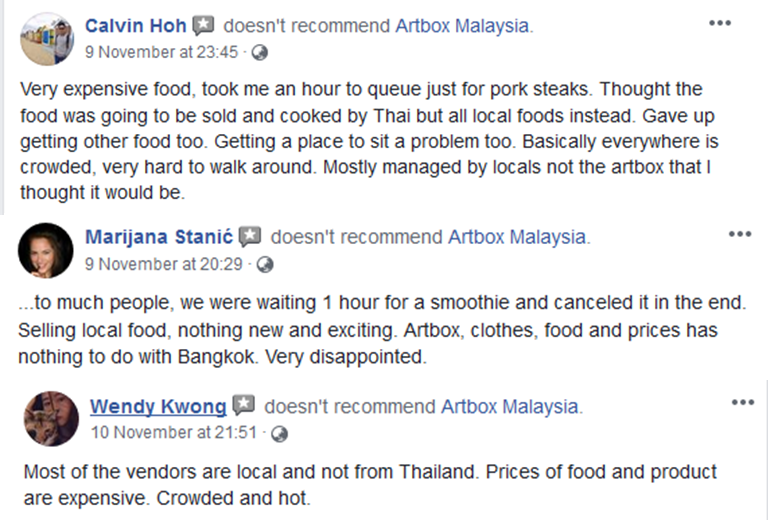 Artbox is known to feature local vendors, so why was this highlighted as an issue? 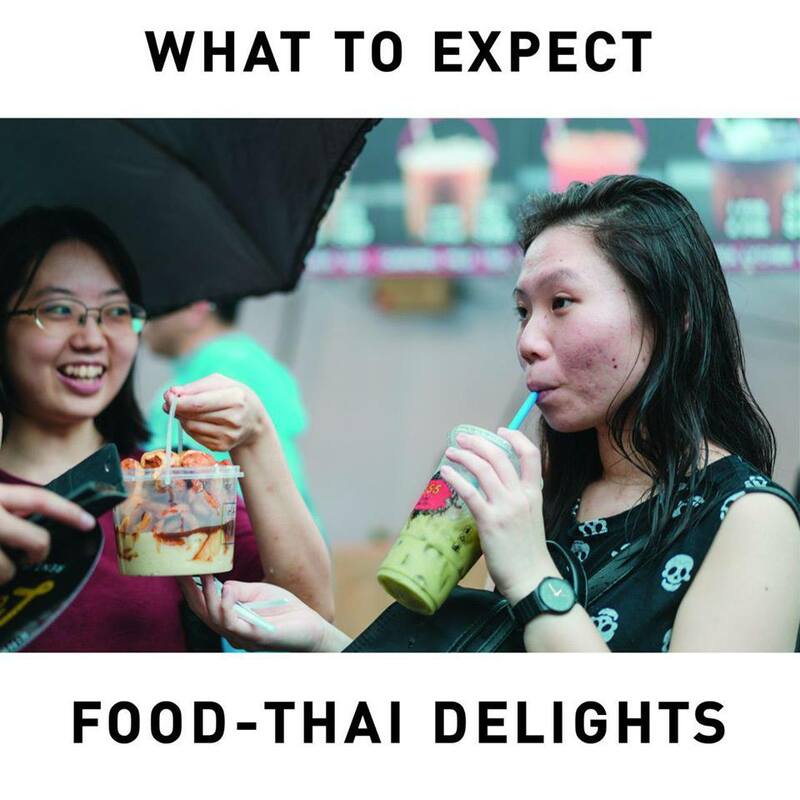 Looking at the advertising, posts and sponsored write-ups for Artbox gave us some clarity: there were some expectations being built up for international cuisine and brands, specifically, Thai and perhaps some Singaporean food, on top of Malaysian items. Screenshot from the Artbox Malaysia page. Screenshot from a SAYS article sponsored by Artbox. This was further confirmed by comments. Taking a look at the people who did enjoy the experience is also quite informative. Most of them praised the look, the vibe, and of course, how good it was for photos. Since entry to the event is free, if the goal was to take nice photos and just enjoy the art installations (particularly at night when everything was all lit up), then you probably left satisfied. However, many people went for the food, and that leads us to the second point of contention. Scroll through the disappointed comments, and you’ll notice a theme, or to be precise, the two words “pasar malam”. Essentially, Malaysians were miffed that they had queued up to get in, and then had to later queue to buy food that they could normally get in their nearby pasar malam. Also, we are admittedly spoiled for choice—consider the massive Taman Connaught or Setia Alam night markets, which happen weekly. We can also pop over to our own neighbourhood pasar malam, which still have pretty good selections, no matter the size. The prices were also said to be an issue. 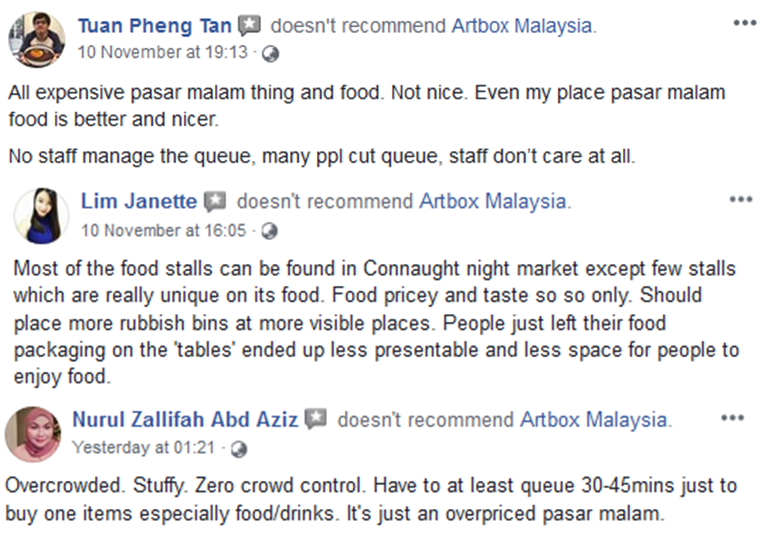 The commenters felt they were served pasar malam food, but at prices that were higher than usual. Couple that with the general discomfort of a large crowd, and that become a pain point to remember. When you go to an event like Artbox, there’s also some expectation of unique or one-of-a-kind offerings. Besides two mentions on the page about exclusive merchandise, we didn’t see much else. The question is, what would make someone want to go, as opposed to visiting those local vendors where they’d normally be? Taken from the Artbox Malaysia page. When it came to food, because of the lack of banners or signage, it was hard to tell if something had been brought in specially from overseas, or if they had unique content only for Artbox. Unfortunately, Malaysians were being Malaysians, and complaints about queue cutting were rampant for Artbox. We experienced it ourselves—while we were lining up to go in, a family of three casually walked past, loudly exclaiming about the crowd. We watched them sneak into the line not long after. Although the event organisers can’t do much to change deeply ingrained attitudes, many felt that more could be done. We personally saw very few crew or team members on the ground to make sure that the crowd moved smoothly, and that no one was trying to just cut in. There were also situations inside the compound where two lines formed, and the vendors had to step in to help re-organise the chaos, resulting in general unhappiness. No organiser can be blamed for the weather (though some people certainly tried; there were complaints about why such an event was organised during the rainy season). When the sun is sweltering down on you, or you’re being pelted by heavy raindrops, or when the crowd presses in on you to the point you can barely breathe… 20 minutes in a long queue feels like a very, very long time. We did notice a lack of large outdoor fans in the area, which left the atmosphere hot and quite stuffy. When it rained, there also wasn’t adequate shelter, particularly if you were queuing to buy food. Manage expectations. Release a vendor list, so that people can take a look and know what to expect. Also it could help if they released some of the prices of the dishes on social media beforehand, so people won’t turn up and be shocked. The food vendors could consider doing previews of new dishes, or come up with one or two Artbox-exclusive dishes, to make people feel as if they are having a special experience. More hands on ground to help with crowd management. A larger venue with better traffic flow. More outdoor fans to help with airflow, and also more shelter or preparation for rainy weather. 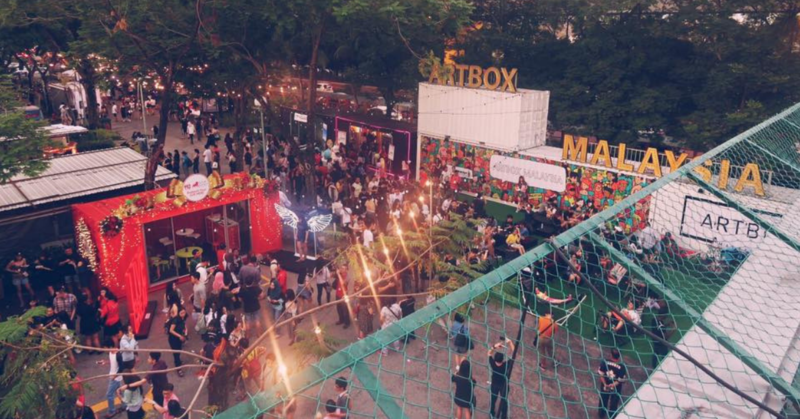 At the end of the day, if you look at the volume of people who attended Artbox Malaysia in just its first weekend alone (although no official numbers have been released yet), we think it can be considered a rousing success. When it comes to social media commentary, it could just be the case where the ones who had a negative experience are more vocal, whereas the ones who enjoyed it simply posted some Insta-stories and one or two photos. Judging by the hundreds and thousands of carefully posed and happy shots of Artbox on Instagram just on the public hashtags #artbox and #artboxmalaysia, people at least got the photo that they wanted, and more likely than not, they’d want to get #artbox2019 up on their feed too. Artbox Malaysia 2018 will be running for its final 3 days from November 16 to 18 at the Sunway Open Air Carpark, Jalan Lagoon Timur, from 3 to 11 PM.